In the third part of this series, I look at using sight signals to communicate more effectively with your dog. 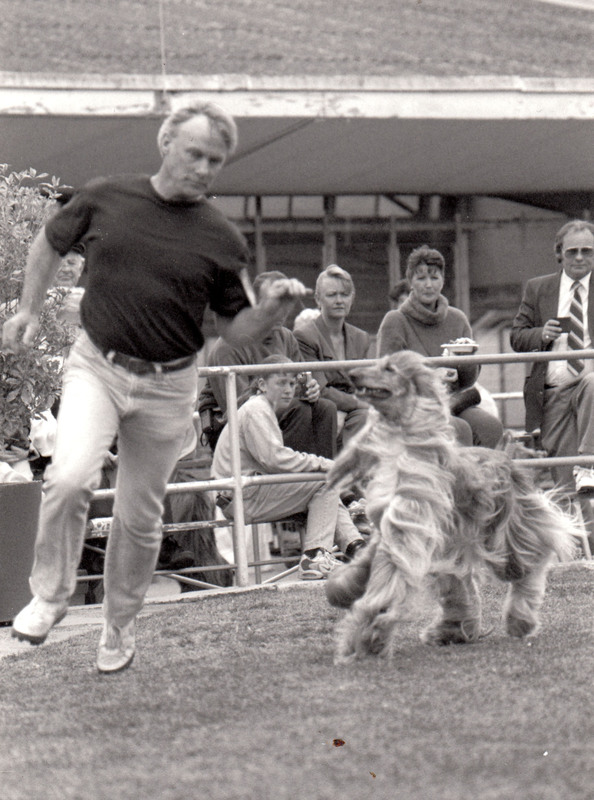 Allowing your dog to run out in front of you in the show ring may look flashy – just look at this picture – but giving up the most important aid available to you as a handler means that you’re relying on sound and touch signals alone. In this scenario, the unsuspecting handler is creating an absolutely unnecessary negative outcome by putting themselves outside their dog’s line of sight. Zoologists researching wolves have established that dogs use four basic forms of communication to signal each other. These forms of communication are scent, sight, sound and touch. As humans, we cannot effectively use scent to communicate with our dogs. This means that we are left with sight, sound and touch. Research shows that there are about twenty sound signals that canines use to communicate with each other including howls, barks, growls and whimpers. Touch covers about seven signals. Yet, when it comes to sight, dogs – quite astoundingly – use more than 130 different sight signals – or visual cues – to communicate with each other. From tail up, tail down to wagging or quivering tails; to relative height, stature and posture; dominant poses to submissive ones; visual cues dominate the communicative repertoire of our dogs in ways that we, as humans, rarely understand. Yet, when it comes to the show ring, most handlers rely only on touch and sound to communicate their requirements to our dogs. And we do this despite the fact that the most extensive ‘language’ that our dogs understand is visual. In other words, our dogs watch us in order to understand what we want them to do. This is why understanding the visual language of our dogs is imperative to effectively communicate what we expect of them. Sight is the most powerful signal. When showing a dog, you can further leverage the power of sight signals by tapping into your dog’s natural herding instincts. The easiest way to do this is to use your body to provide visual cues. For example, if you simply walk or run, up straight, with your head held high and steady, eyes looking forward, in one direction and at a constant speed, you’re providing your dog with a virtual ‘script’ outlining exactly what is required of them. This script tells your dog what direction you want them to go, the speed at which you want them to move, and, more importantly, you’re making it abundantly clear that you are the leader in this pack. This is why, while having your dog run out in front of you may look flashy, you’re actually depriving yourself of one of the most powerful communication tools you have at your disposal. A further drawback of letting your dog run out in front of you is that you’re actually restricting your dog’s front reach by loading against the lead. As I discussed in part one of this series, if your dog pulls forward and you pull back to control their speed or direction, then your dog must pull equally hard or even harder to maintain their balance. This can result in your dog ‘grabbing’ for the ground (sometimes referred to as ‘fence digging’). The opposite is achieved when you let your dog run on a loose lead, which allows them to stride freely over the ground. In addition to this, letting your dog run out in front of you means that your dog is dictating their speed, which you can only moderate by using the lead. So, not only can’t your dog see how fast you want them to go, they also can’t see what direction you want them to go in, when you want them to turn, when you want them to speed up, slow down, stop, or whatever else you require them to do. In part four of this series, ‘How to use signals your dog understands’, I’ll be looking at the difference between good and bad sight signals and what effect these have in the ring. Meanwhile, if you believe in the ‘out front’ method for showing your dog, I would love to hear from you about how you counteract some of the problems this handling style can create.